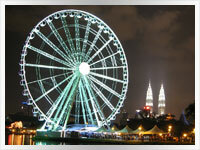 This short Malaysia small group tour is ideal for those in transit through K.L. and with enough time to check out K.L. & historical Melaka. Just enough of a taste to become addicted to magnificent Malaysia. *Want to do this tour from a Bangkok transit instead? We can arrange flights to K.L. at great prices if so with possibly a night or two in Bangkok. If you want an easy introduction to the region then Malaysia is a great choice. Welcoming, safe, hassle free and with food unrivalled anywhere else on earth. Malaysia has it all but is still as truly Asian as it gets. Many new and old attractions in both K.L and Melaka will enthral you. Once you visit Malaysia you will only want to return again and again as it is possibly the most addictive country in the world for both food and even more so for the friendly faces. ACCOMMODATION = (7 nights x 3 star hotels). KUALA LUMPUR, (K.L.) - MELAKA. K.L. City Tour, (half day). Tonight our Malaysia small group holiday tour will stay in; KUALA LUMPUR - Our short Malaysia group tour officially starts when you check into your Kuala Lumpur accommodation. A welcoming dinner will be had in the evening. 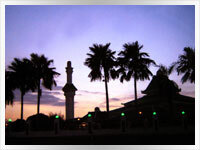 D.
For an even higher view of the city try the 421 meters tall Menara K.L. (K.L. Tower) built on top of the Bukit Manas Forest Reserve. Then in no particular order, it may be the colonial Kuala Lumpur Train Station, Merdeka Square, Masjid Negara (National Mosque), Masjid Jamek (Friday Mosque). Or stroll around the nearby Central Market or Lake gardens where the K.L. bird Park; www.klbirpark.com is the worlds largest walk in aviary with almost 200 species of birds. KUALA LUMPUR - Start your exploration of K.L. with an included half day city tour with a local operator to some of the major attractions The rest of the day is free and the city centre is reasonably compact which makes for an interesting meander in itself. B. Nearby Petaling street in Chinatown has innumerable shops & street vendors. Other opportunities for shopping include The Central Market or the Royal Selangor Pewter Factory. With the new, cheap and extensive light rail and monorail things are now a breeze to get around to see all the attractions. Well worth a visit also is the Batu Caves, a short bus ride out of town. Walk up the 272 steps to the impressive Temple Cave. The Batu Caves is where the yearly, three day Thaipusam Hindu festival is centred around. Tonight our Kuala Lumpur & Melaka small group stopover tour will stay in; MELAKA - A short bus ride today will have our small group tour in the UNESCO World Heritage City of Melaka. Melaka has one of the richest histories in all of Malaysia. Start at Melaka's most well known pink landmark of Stadthuys (Town Square) in the historic town centre which may be the oldest Dutch building in the East. A number of museums in the area include the Islamic, Architecture, Peoples, History & Ethnography and Literature Museum among others. Then maybe, St Paul's Church, 8 Hereen St, which is a Heritage trust of Malaysia restored Dutch Era residential house, Cheng Hoon Teng Temple (circa 1646), which is still in use today by the local Buddhist community or the oldest functioning mosque in Malaysia of Masjid Kampung Hulu, (circa 1728). Melaka has far too many attractions to list here. Nonya food is one of the different styles more famous in Melaka but you will find a plethora of others, both local and international. Between seeing and eating you can browse at the many shops along the famous Jonkers street now called Jalan Hang Jebat or at the modern shopping mall of Dataran Pahlawan. Once again be warned of the biggest danger in Malaysia of overdoing the hotel breakfast. B.
MELAKA - A free day to explore any of the above, most of which is centred around today's Chinatown. Maybe a Banana Leaf meal in nearby Little India? B.
MELAKA - Another free day to explore. Maybe take an inexpensive, short but entertaining boat tour on the Melaka river. You will be glad of the second full day in this relaxed but still fascinating destination. B.
Tonight our Malaysia small group vacation travel tour will stay in; KUALA LUMPUR - Our small group tour will return at leisure to K.L. with the rest of the day free. B.
KUALA LUMPUR - A last free day in wonderful K.L. to gather up all that shopping that you picked out on arrival and/or some further sightseeing. A farewell dinner will be had in the evening. B. D.
Our taste of Malaysia small group holiday tour is officially over when we check out of our K.L. accommodation. An airport transfer is included also. B. You now know just how good Malasia is with a short taste of it and more.